Tesla's latest software update “makes it almost impossible for a Model S driver to run out of range unintentionally,” CEO Elon Musk says. Tesla Motors CEO Elon Musk promised a solution for range anxiety. But when he presented his fix during a conference call Thursday, four days after making his promise with a post on Twitter, it was not about extending the driving range of Tesla’s electric vehicles, but about making it more difficult to get stuck on the side of the road with a dead battery. Tesla, which has broken with convention by sending over-the-air software updates to its Model S sedan, today unveiled its latest upgrade. Version 6.2 adds two features -- Range Assurance and Trip Planner -- that automatically plan charging stops using the navigation system and warn a driver if a road trip is likely to leave them stranded. It has already been beamed down to a handful of customers for testing and is scheduled for a broad rollout in about 10 days, Tesla said. 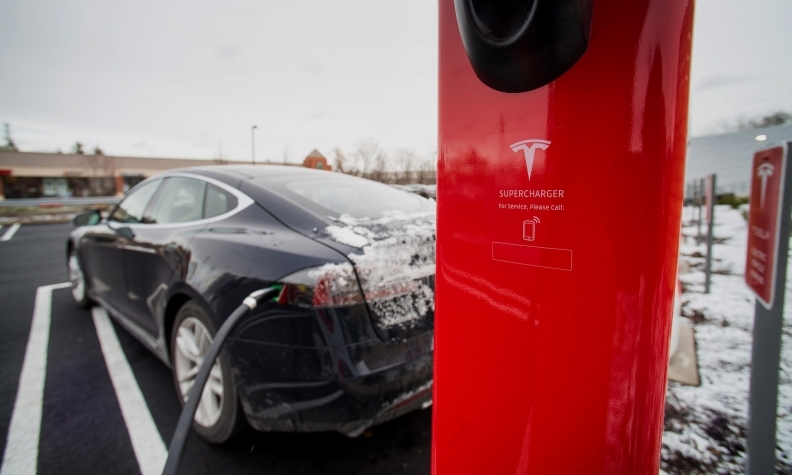 During a conference call with reporters today, Musk said Tesla’s cars will now communicate in real time with Tesla’s network of proprietary chargers, which are called Superchargers. The information will be refreshed every 30 seconds, and if a charger goes out of service or a closer one becomes available, the car will reprogram its navigation system to choose a faster route. The move shows Palo Alto, Calif.-based Tesla’s determination to ease the fear of running out of juice -- a top concern among consumers. Two years ago, when The New York Times published an article about a journalist running out of power in a Model S during a drive up the East Coast, Musk penned a fierce rebuttal, accusing the reporter of intentionally draining the battery. Tesla’s latest software update “makes it almost impossible for a Model S driver to run out of range unintentionally,” Musk told reporters. The over-the-air update also adds safety features. Cars built since October, when Tesla started production of the Model S with an array of cameras and sensors, will get automatic braking, blind-spot warning and side-collision warning. That closes one of the few major gaps between the Model S and cars from rival brands such as BMW and Mercedes-Benz, which generally include these “driver assist” features in their high-end luxury cars. Musk said Tesla intends to release a software update every three or four months and said Version 6.2 would be the last major revision to the current software package. The next update, Version 7.0, is slated for release later this year. Musk said Version 7.0 will include an auto-steering feature that will allow the car to steer itself on the highway, as well as a new user interface. “You’ll kind of need one, considering how the car’s going to interact with you in the future,” he said. Right now the Model S offers “autopilot,” which functions like adaptive cruise control. Customers can relinquish the wheel and pedals at highway speeds, while the Model S maintains speed, follows the pace of traffic and stays within lane markings. The driver can change lanes by flicking the turn signal lever. Musk said the more advanced system that will be released in Version 7.0 will be restricted to two driving scenarios: low-speed driving on private property and high-speed driving on highways. That’s because Tesla isn’t confident the feature would be safe at moderate speeds in suburban settings where a child might run into the street chasing a ball. At low speeds on private property, the car will use ultrasonic sensors to drive itself. Musk said that will allow someone to summon his car from a driveway to his location or allow the car to “put itself to bed” in the garage.